Wikipedia describes a bad habit as ‘a negative behaviour pattern’. It includes common examples like phone addiction, sleeping habit, nail biting, procrastination, overspending time watching television or on the internet, gossips, drinking alcohol, smoking etc. A habit has a significant role to play in our lives. It makes our image and personality and creates our future. Bad habits affect us both mentally and physically. We may be loath to admit it, but everybody has at least one bad habit. Some bad habits can pose serious health risks such as drinking alcohol and smoking, some effects on our life and goal such as phone addiction, internet addiction etc. While doing these things generally we never feel that how these things will affect our lives and how it prevents us from accomplishing our goals. We do not realise all these, because at that moment we enjoy doing this. And whatever we enjoy doing, always attract us to do that again. Soon we get addicted to it, and it becomes a habit. “We first make our habits, and then our habits make us”. Whatever we become in our life is the result of our habits. Starting with this quote, we must understand a proven fact behind the development of a habit. It starts with a psychological pattern called a habit loop. This loop consists of three stages Reason, Repeat and then Reward. First, there is a Reason. Reason triggers our brain to initiate behaviour. We brush our teeth or take a bath because we have reasons to do these activities. Because of specific goals, our mind triggers us to do it every day. So every habit has some causes and some motivational factors which lead us to start the activity. Second is routine. If we do not fulfill the trigger, we feel restless. Once we get attracted towards a reason or a cue we go back to do the same thing again. Our mind always gets attracted towards trigger and insists us to do the same activity every day, and it gets included in our routine. For example: If you are addicted to phone or internet, here your phone is the trigger which is attracting you towards Whatsapp, Facebook, YouTube. Once you started with these things you get attracted towards them and every day whenever you get the time, you will always find yourself watching YouTube, doing Whatsapp or these kinds of things which will never let you study because now it is included in your routine. Not controlling cues (YouTube, Facebook, web series) will make it your daily routine and later you develop a habit of always being engaged at the cost of your studies. For example: In the above case you will find reward for yourself: after some years when you see other students, who focused in their studies, they are getting top ranks, they are getting appreciation everywhere, they have increased their skills, they are getting a good job etc. At this point, you will realise you have wasted your time doing unnecessary things, and it led you nowhere. At that time these things were giving you happiness but now gave you long-term worry and sorrow. You did not focus on improving skills, getting a job. Rewards of bad habits teach us many things, and then we identify what we lost. Soon we realize our bad habits, and then we want to break it. It is when; you take actions to break your habits. Without your willpower to change something in your life nobody can change it. It is your desire which can solve a problem. To enjoy our life happily, we must break our bad habits. 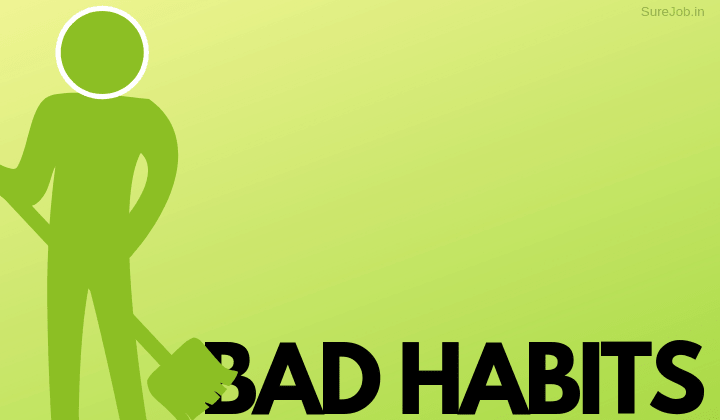 Read here how we can actually break our bad habits. You all will admit if I say it requires lots of hard work and dedication to develop a good habit. But it takes only a few weeks or sometimes just a few days to build a bad habit. Because we get attracted to bad habits easily, which give us instant happiness. So we develop these habits faster than good habits. If you have realised and want to break your bad habits, it is possible, and yes it is challenging too. Because here you need lots of courage to fight with yourself, you need to be focused and ready for hard work. You cannot get over your bad habits unless you really want to break it. Sometimes you lose willpower and get bored in the process but at that time think about the bad reward you got from a bad habit. “Where there is a will there is a way”. If you really have made up your mind to kill all your bad habits, you have to follow these steps to get rid of it. Find the reason behind everything you do. List down the reasons which are attracting you to perform certain activities. For example: If you are phone addict then Facebook, Instagram, Youtube, web series are your trigger point. If you are not able to lose fat, having cookies and chocolates is your addiction etc. Find out for yourself, and you will find that there are so many reasons why we start a bad habit. Some bad habits are so attached to us that we cannot change them in just a few months such as drinking alcohol, smoking etc. These things will take years to improve and only if you really want to do it. You cannot stop doing these right away. Try to develop a substitute for these or try to cut down slowly. Don’t make a plan that suppresses your mind. Addiction will never go away in one day, and if you suppress your trigger instantly, you will get bored and later you will leave the process. For example: do not make a plan to throw your smartphone in dustbin right away. Replace your addiction with different things. You can install study applications or puzzles, quizzes or learning apps on your phone. You can subscribe to some interesting facts channel on YouTube to increase your knowledge without wasting time watching random videos. Whenever you want to use phone open these apps and slowly it will be included in your routine. Likewise, if you are dieting, instead of keeping chocolates and ice cream in the fridge, keep healthy foods. So you can fulfill your craving with these things. In this way, you resist your mind from repeating bad habits. It is an excellent way to keep a tab on not repeating your bad habits. For example, promise to your family members or friends that every time you repeat any of bad habits you are going to pay the bills for your friends. Or you will clean your whole house or rooms of your friends. Or you will not have your favourite food for a week. In this way also you can resist yourself. Make a note writing that, what will be the long-term consequences if you continue these bad habits, and how it will affect your future and your family and loved ones. Write down all possible points and keep it in your wallet or keep it on your mobile’s wallpaper. So that every time you see this, it will work as a reminder. Sometimes it happens that we want to study, but we do not do because our friends or roommates are not studying. If you want to change a bad habit and in your group, nobody wants to do it, then definitely they will not let you leave that habit. They will always try to provoke your mind and convince you for repeating it again. For example: Suppose one member of the house wants to lose weight and started dieting and other members have parathas and ice cream every day. For how long the person can resist himself from not having parathas? He can control for maximum 1 or 2 weeks after that he would try a bite of paratha and then one paratha a week, and soon he will start having it every day. Now his diet plan is replaced by parathas. So change your environment and group for some time, if you really want to break a habit. All of us want some kind of entertainment in our lives. But we should not waste the whole day enjoying the things. We should fix the time for these kinds of activities. We must ensure that these entertainments are not affecting our future. Always remember, leaving a good habit and picking the bad one does not take time but it does not work vice versa. To break a bad habit, you have to work hard and you will face many problems. At that point, think about the goal for which you want to improve yourself. Your purpose and reason behind your decision will give you the motivation to stick on your path. Breaking the bad habits is only your call, and it is you, who will decide not to do certain things which are severely affecting your life and future, and it is your willpower which will determine where you want to take your life.